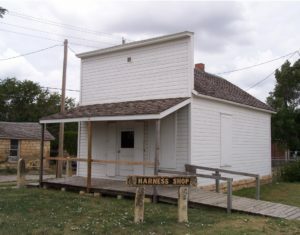 This two-room frame building is the original Younger Harness Shop that stood on West 11th Street in Hays around the turn of the last century. This was once the home to the eleven member family of John F. and Margaret (Stegman) Younger and to his harness and cobbler business. Now located on site at the Ellis County Historical Society, it houses our collection of saddles from the many local ranches through the years as well as several other related artifacts.